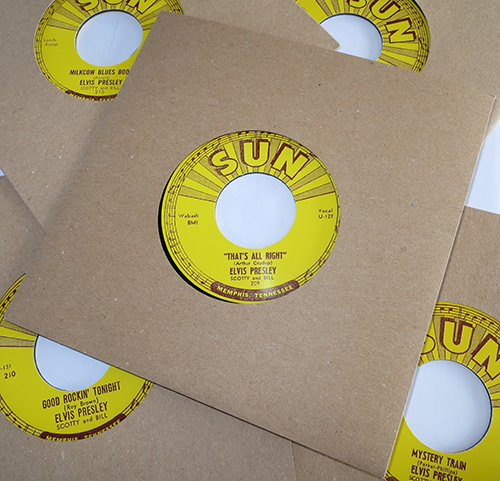 250 sets have been produced of Elvis’ Sun 45rpm 7” (inch) replica singles. With the same of last year’s release of the 10” (78rpm) version, each of the 5 Sun 45rpm replicas have the original etched numbers included with the appropriate song sides and is by far the most original Sun replicas made to date. Not only are all the labels perfect (as the original in size, color and accuracy), the sound quality is excellent with the original Sun sound (including That’s All Right) pressed on heavy stock vinyl. The singles come in the same type brown paper sleeves as sold with the original releases.